In case you missed it, we just put a new 2012 Around The World Calendar in our shop over the weekend. 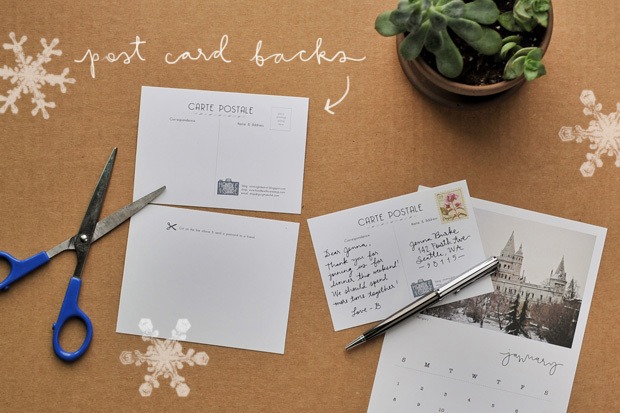 It features some of our favorite photos from our travels and doubles as a set of postcards. We'd like to give a calendar to one of our blog readers! Leave a comment below letting us know one trip (near or far) you are planning to take in 2012. We will draw a winner at random from the comments. ** Giveaway closes Wednesday, November 30 at 10pm PST and will be announced here on the blog Thursday morning. Check back to see if you won. Oooh I would love love love a calender. So my plans for 2012, well after backing packing around Europe for 10 weeks I am planning to rent a unit in Paris for a week with my husband in January. The end of a fantastic trip. And I have to thank you guys for the inspiration to just buy those tickets and go. I'm planning on moving (back to) Malta in January, and hopefully scooting off to Copenhagen for a weekend trip! I'm planning on taking a couple trips to Boston in 2012...not terribly exciting, but maybe something more adventurous will pop up! After spending this semester in Amsterdam, Morocco, Bosnia, and Croatia, I'll be studying in Copenhagen next semester and taking an awesome trip to RUSSIA! Heyo! My husband and I are planning on a huge road trip from colorado to southern cali, and then up the coast to seattle, and then head over to glacier national park in montana and then head south to grand teton national park before returning to colorado! We are really looking forward to it and are about to start doing some serious planning! In 2012 my plan is to visit some countries in Europe (Croatia, Italy, Hungary,..). I just came back from 20 months travelling - so its time to see more of Europe. I'm planning on trips to Beirut, Kuwait, South Africa, and Australia. 2012 is going to be good! Hopefully, it's going to be Leh, India. The calendar looks amazing; I'd love to win! And I'm planning to visit Ireland next summer! My boyfrind and I are planning a trip to Europe. We are thinking London, Ireland, and Scotland! So far, the only place I'm going is home to Utah. But if my wildest dreams come true, I'm going to Iceland in the summer! I'm trying really hard to get to Japan this year!! I'm traveling stateside to visit family and then to Japan!! Nice! I'm hoping to either go [back] to the Dominican Republic to visit a friend who is teaching down there, or head to New Zealand over the 2012 holidays for the premiere of The Hobbit. Yep. First I would like to say "thank you", you answered some travel questions I had through Formspring back in the summer when I was planning a trip to Barcelona. Your advice really helped. Now that I have the travel bug I'd like very much to go someplace tropical. Theres a possibility to go to Hawaii for some work so I'm working on making that happen. Get paid to travel? Yes please! I could use a break from the Vancouver weather, haha. Your calendars are beautiful and I would love own one! this calendar is just lovely! Hoping to make a trip to Europe this year, esp Italy! never been and would like fulfill this lifelong dream! Although we haven't made any official reservations yet, we plan on going sea kayaking in the Apostle Islands in Lake Superior. Your calendars look great! I've been looking at gorgeous calendars for 2012 lately! I know I'll be taking a trip to Southern California (not super exotic, I know)...but I'm hoping to make it to Costa Rica if the funds kick in! I have booked a trip to Paris and I am so excited to return to the City of Lights! what a cool giveaway! i would love to have it on my desk in my dorm (: thanks for hosting the giveaway. I, at this moment, don't have any international travel planned, but I will be going to many different states around the US next year. Florida, South Carolina, New York, Illinois, Tennessee, Maryland, and hopefully some others! I might even move out of my current state of Georgia. Exciting potential!! The calendar looks beautiful. I'm hoping to visit my Dad in the Middle East sometime this year and maybe a trip to Japan with my roommate. I'll be going to Alaska for the summer! (You guys should visit) I'll be working at a coffee shop there for three months, and I couldn't be more excited! I would looooooveeeeee to win a calender. And we will travel with our 2 small boys in januara 2012 for 2 month to thailand. France! I'm going in June to photograph a wedding for a friend :) I'm soooo excited. I have only been to the Paris airport, but never outside. Beautiful blog you have. We will be traveling in our vintage 1962 Airstream around the states West of MO. We spent 4 months in her this year, and hope to spend at least 4 more next year! First off, love the site, the photos and, especially, the calendar! Next year I'm planning on moving to Thailand to do some teaching abroad, hopefully involving some weekend trips to Laos, Cambodia, Vietnam and China! My big trip for 2012 will be to Ecuador. I'm half Ecuadorian and I've dreamt of getting to know my roots for years. My mom hasn't been back in over 30 years. It's going to be a great mother-daughter trip. I'm sure it will be life changing! I wish I was going back to Europe but I think the farthest I'd be traveling is to San Luis Obispo or San Diego! LoveLoveLove this calendar! My fingers are crossed! Kenya! I will be going to Nairobi on a economical mission trip! I have been dreaming of a trip to Iceland for so long! I would love to go there!!! This calendar is so gorgeous and the postcard feature is THE BEST!!!! I'm going to Iceland in February :) super excited to go with 2 of my good friends!! I'm going to Thailand with some friends that run a nonprofit organization! I'm so excited! In January, hubby and I are off to visit some friends on Kwajalein Island in the Republic of the Marshall Islands. Super excited as there's no tourism there and you can only go if one of the 1500 people who live there sponsors your visit!! I am going to the Mayan Riviera in March for my honeymoon!!!! I'm hoping to take a trip back to Palestine to visit my boyfriend. 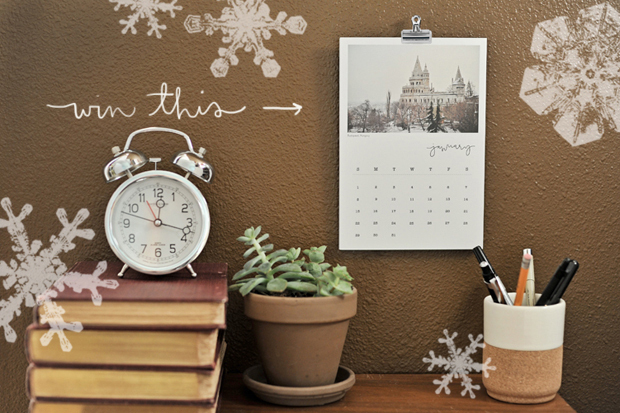 This cute calendar will help count down the days! I love the calendar. I went to Greece and Turkey a few months ago so I can't afford anything too pricey for 2012. The only thing I have planned is an upcoming trip to Philadelphia. I am taking a trip to Hawaii with family next year, so excited! I'll be spending 6 weeks in Paris for a study abroad program and then spening the rest of the summer in Italy and England! I am planning to explore my new home Australia - starting with a roadtrip for 2 weeks in January from Melbourne to Sydney and back!! My husband and our two best friends are off to Southeast Asia in a few weeks to spend three months backpacking through Thailand, Laos, Vietnam and Cambodia. I can't tell you how excited your beautiful photos have gotten us! camping in Kauai for a late honeymoon! India for 2 weeks in January, can't wait! i'm planning a trip to california for m birthday, and if i'm really lucky india. I am heading from Korea (where I live) to Thailand for adventures in Jan, and then to Bali for yoga, cooking classes and meditation and then in the summer my plans are to finally explore the spirituality and breathtaking landscapes of Tibet. I'd love to squeeze in a trip to Scotland with my mum, as I'm from England but shamefully have never made it that for north! Great design on the calender, would love to be able to send your postcards to my friends while living out here in Seoul. I will be going to Japan with my brother in April. We've never traveled just the two of us before, so it should be fun. Our main goal is to soak up the culture, eat a lot of good food, and have a good time. I am graduating from college in May of 2012 (which I cannot believe it is happening already). Immediately after graduation I am planning a big trip. I currently have three options and I have yet to choose. 1. Tour from Indiana to Florida with a friend's band as their photographer, just for the heck of it and good experience. 2. Going on a cross country camping trip with a few of my best friends as a graduation present to ourselves (or perhaps even traveling abroad if we find the funds). 3. Going on a trip to somewhere new with my 4 other family members. I am planning on going to Spain for a week in February! I cannot wait to see the new culture. The calendar looks great and I love that you were able to take such a long trip! I'm gonna be in Sri Lanka July on 2012! Can't wait! NEW YORK CITY where I will visit film locations of Home Alone 2 and spend my 30th birthday celebrating at Times Square! Time for visit the New World with a blast after trooping around the Old World for years. I am looking forward to be lost in translation with the Cyrillic alphabets and exploring the Orthodox monasteries in Bulgaria; and be culturally immersed with the Islamic culture, be awed with the Ottoman-style mosques and embark in my virgin hot air balloon ride in Turkey. All these in spring 2012. Hey ! I love love your blog ! I have big plans for 2012...planning a trip to the Himalayas..they are a beauty ! It will be a backpacking trip, shoe string budget but sooo much fun i am sure ! So beautiful~~I'm planning a trip home to Taiwan! Cancun in Feb! Hopefully I'll be able to see the pyramids! My husband and I plan to visit friends in Turkey and travel with them in that country. Definitely something to look forward to! My husband and I plan to visit friends in Turkey and then travel the country with them. Definitely looking forward to the trip! we're planning some fun adventures to Portland, Austin, and New York!! I'm planning a trip in late Dec. 2011 to early Jan 2012. I will be spending two weeks in Amsterdam and a couple cities in Belgium. I truly cannot wait! This will be my first "real" visit to Europe! I'm also tentatively planning a summer trip to Sweden! I would like to spend a full month traveling around the country. Currently saving up the pennies. btw, I absolutely *love* your blog! You take fantastic photos! Hi there! I'm Niki from Greece! I follow your blog almost from the beggining of your travelling,your photos are magical!!! My husband and I are planning a road trip to Italy next spring! Great giveaway, I hope I win! I would love to win this calendar especially because of the Fisherman's Bastion photo! I live in Budapest and I think it's a beautiful building! I love your blog, the pictures are amazing and it just makes you wanna travel. My next destination will be South Africa. I can't wait to see the amazing landscapes. I'll be spending a semester abroad in Romania, with a short jaunt into Italy and the Ukraine! Our travel plans for 2012 are going to be a little different than 2011 where we visited Bratislava, Vienna, Marrakech & most recently Cologne as im almost 8 months pregnant! However my sister has just emigrated to Australia so we are planning to take baby on his first ever trip on a plane all the way from Edinburgh, Scotland to Perth, Australia! Lets hope he enjoys travelling & planes as much as his parents! I'm going to Hong Kong to see my brother, I've never been more excited about a trip. I miss him sooo much!!! I would love to win this!! Your travels have been so inspiring! I'm headed out to Los Angeles this year. I am going to Medellin, Colombia for New Years 2012! I recently found the love of my life who happens to be a wonderful man from Colombia. Pablo and I are currently living in Saudi Arabia where we are marine biologists. We found each other in the most unlikely of places, here in the giant sandbox, half a world away from our native lands. So, for New Years, I will be traveling to the mountains of Colombia to meet la familia de mi amor! My best friend Elle and I are hopefully going to England in April. She did visit Europe over the summer but had a terrible time with the person she was with, so hopefully this trip will restore her faith in europe! My family and I are planning on going to India next winter to visit my mother's side of the family! It has taken us years to plan this, and it's still up in the air, but we are all trying to make it work. If not, we will travel to Canada to visit our other relatives in the summer. I love the calendar! I want a calendar! I'm not going much of anywhere in 2012 sadly, except for St. Thomas, but I'm not complaining about that! This isn't as exciting as other peoples plans to go overseas, but my husband and I are going to Melbourne for a week in February for our two year wedding anniversary. He has never been to Melbourne and I have been about four times and absolutely love it!! The week is going to be jam-packed with visiting the largest outdoor markets in the southern hemisphere, visiting the aquarium, wandering through the alleyways and streets, looking at beautiful architecture, and eating at a few chocolateries! Possibly a trip to Uganda next Fall. Would be fun! i've been getting lots of personal emails about how fab your site, calendar and photos are.. you two are amazing!!! if i could blink myself somewhere new, it'd be paris or montenegro.. (; t.
I'm going to Finland this summer! And I hope to Sweden too; we'll see. I can't wait; I've wanted to visit Scandinavia for years! Hi, I am going to take a trip in February to Hokkaido and I will be visiting the Snow Festival there. Then I will spend a few days in Tokyo. I am hoping to take a trip to visit my Godmother in Massachusetts and/or my Aunt & Uncle in Tennessee! I live in California and haven't been to the other side of the country yet!! It's about time!! I am planning to go to Seattle, Wa to visit my daughters. It's not very far, but I love Seattle! I'm planning a year long trip all over the world for 2012. The countries I am most looking forward to visiting are Ecuador, Tanzania, Indonesia, and India. My husband and are planning to visit some friends in Arizona and visit this little town called Bisbee. It's pretty amazing. the only trip which is 100% certain is a trip back home to california for my brother's wedding, but hopefully we can squeeze in a trip to Morocco and our belated honeymoon somewhere in asia :) LOVE the calender! Does going to the Dominican Republic over Christmas count? It should! I'm very excited... And probably Prince Edward Island this summer too! London - I just can't seem to get enough of it (: and of course I'd love to call one of your calendars my own...I'm hoping this giveaway is also open to international readers. I am planning a trip to a friends wedding in Florida, come January. It's a very special event because she is only 26 and widowed (her husband died in Iraq, 3 years ago). Last time I saw her we went to her husbands funeral, so this time around we get to celebrate :) God is good! Greatly looking forward to this trip! I will be going to Seattle in the spring to visit a dear friend.... can't wait! I have been studying in the United Kingdom since September and I have been traveling a lot, like to ireland, spain, italy, prague, hungary. I contacted you over the summer to ask for your recomnendations on Greece and Paris. Everything you recommended was superb- especially Momma's House in Santorini! We made close friends with a couple we meet in Santorini and will be visiting them in Australia next year, then we will fly into Thailand. I would LOVE to win a calendar and keep it as a reminder of the marvelous places that exist in this world. Hi, I'm putting together a trip to Spain as a surprise. I'm hoping to explore Basque region and Barcelona. You have a lovely blog and your photographs are amazing! Beautiful calendar! In 2012, my partner and I will continue the journey we started in 2011. We have taken a year off of "real life" to travel the United States and Canada. To climb, hike, see, do, meet, and explore! In 2012, my partner and I will continue the adventure we began in 2011. We will be taking the year to traveling through the United States and Canada to climb, hike, see, do, and explore!